Soak lentils in cold water for at least 2 hrs. Strain and cook in water for approx. 30 min., or until softened, then strain. Meanwhile, slice the smoked trout fillet. Wash and cut spring onions into thin rings. Peel and finely dice carrot, celery root, onion, and potato. Heat some of the olive oil in a large pot. Sauté diced carrot, celery root, onion, and potato for approx. 2 min. Add vegetable stock and cook over medium-low heat for approx. 5 min. Add marjoram, ginger, garlic, orange peel, and cinnamon stick to the pot and cook for approx. 5 more min. Remove cinnamon, orange peel, garlic, and ginger from pot. Add lentils trout fillet and spring onions and stir to combine. Season with salt and pepper to taste. Pour away any excess stock, but leave enough to coat the lentils. 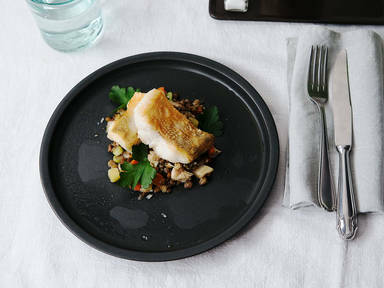 Slice pike perch into serving sizes. Season the fillets with salt and dust with flour. Heat remaining olive oil in a frying pan. Fry the fillets skin side-down over medium heat, until the skin is crisp and golden brown. Flip and reduce the heat. Add butter and fry the fillets briefly in the butter. Remove from pan and pat any excess grease away with a paper towel. Serve the fillets over a bed of lentil salad. Enjoy!